Iceland‘s popularity has grown enormously in recent years. The number of tourists has skyrocketed, Justin Bieber was just over for a visit and some of the biggest movies in Hollywood and Bollywood have been filmed here. It was only a matter of time before one of the big running companies came calling. 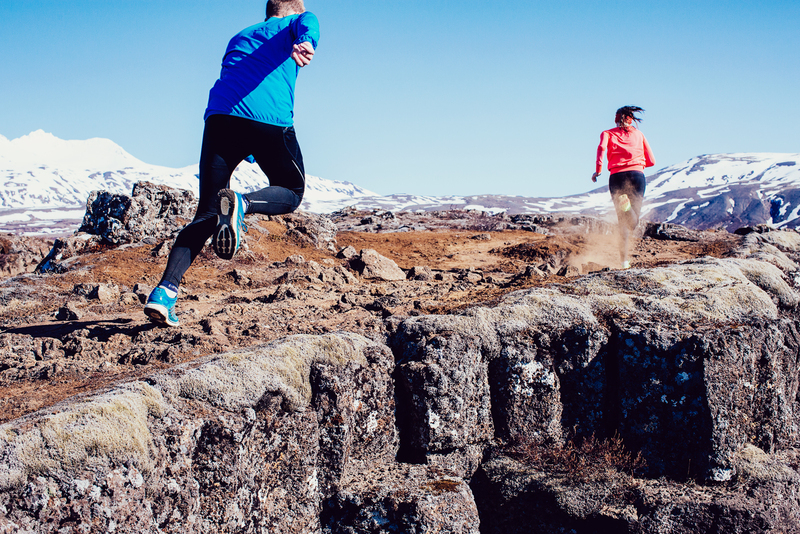 In December Saucony launched an advertising campaign „Saucony Runaways“ which features Iceland as a central theme. It was shot in some of Iceland‘s favorite running spots this fall/winter with assistance from local runners Birgir Saevarsson and Elísabet Margeirsdottir of ArcticRunning. The campaign has Iceland as a focal point with many of the pictures showcasing Iceland‘s stunning locations as much as the products. We asked Saucony‘s director of digital marketing Sean Robbins to tell us a little bit about how the campaign came about. What was the idea behind your trip to Iceland? Our mission at Saucony is to inspire runners, and we’ve always felt running is one of the best ways to experience the world around you. We also knew from our conversations and research that many runners love to travel. The combination of those ideas led us to Runaways. A Runaway can be anywhere in the world, near or far. All you need is some curiosity and a good pair of shoes. Iceland is the perfect place for a Runaway. The combination of mind blowing scenery, great culture, food and hot springs is a runner’s dream. Why was Iceland chosen as your destination? In the last few years Iceland has really emerged as a place travelers want to go, for so many good reasons. We had seen several guides to Iceland, but none that explored the country through the lens of a runner. We needed to showcase our winter gear, so the variety of landscapes and extreme weather was ideal, and it didn’t hurt that it’s a short trip from Boston, our home city. We spent 5 days in Iceland and felt like we barely scratched the surface of places to run and explore. We had a packed agenda, but still left feeling refreshed and recharged. The people and way of life are so calming, it sort of feels like stress and worry just melt away. The best way to sum it up is to say that none of us have stopped talking about it since. Can you tell us something about the Seekers? Who are the people who joined you on the run in Iceland? Birgir and Elisabet from ArcticRunning.is helped us plan out and then guided the whole trip. They did an amazing job and we can’t thank or recommend their services enough, we showed up as clients and left as friends. We also had two American runners join us who embody the adventurous spirit of Runaways, and who are perfect representatives of the Saucony brand. Brett Farrell and Kim Bessler. Brett is a trail runner from Oregon who followed his passion and founded his own clothing brand, and Kim is a Chemical Engineering student from Colorado whose ultimate goal is to design polymers that do less damage to our environment. They both have great stories worth reading on our Runaways – Iceland webpage. What was your favorite running spot in Iceland? The trails around Thorsmork. We were traveling to the Volcano Huts with a Super Jeep and a Land Rover. We got our Land Rover stuck in a river and piled into the Super Jeep to keep going. Hakon, our driver from Super Truck Tours, is a legend behind the wheel, and got us through some hairy terrain like it was a normal Tuesday commute. We saw the Northern Lights that night at the Volcano Huts (unusual in October), and the next day ran 8 miles along the ridges around Thorsmork in the driving wind and rain. The entire experience was unforgettable, definitely something any runner who is visiting Iceland should try and do! We also found out there is an ultra marathon that runs through the same area, and that’s now officially on my bucket list. We are visiting Iceland June 17, 18 and 19, we will be staying in Reykjavik and am looking for a 5 or 10K race. Does anyone know of anything going on. Thanks! We still haven’t all the dates, but I don’t know of a 5 or 10K around that time. Still might happen though, keep checking the calendar on this site. There is a 14K trail race on Mt Esja on the 18th( twice up the 600m mountain! ), and the Midnight Run is on the 23rd!